Burayr - Where Was Burayr Located? One of the Villages/Cities of Gaza District, find here important information and profiles from Burayr. 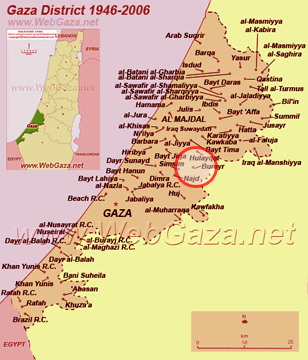 Burayr is located in the east part of Gaza District, southeast of al-Majdal, south of Hulayqat, as shown on the map. Israeli Occupation Date: 12th-13th of May 1948. Burayr village was completely destroyed, and only house rubble left behind. Burayr inhabitants were completely ethnically cleansed. Five Israeli Settlements have been established on Burayr village lands. Scattered cacti as well as some lotus and sycamore trees grow on the site. One can see remnants of houses.